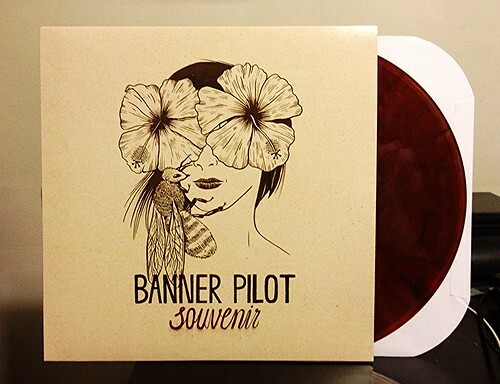 I've been following Banner Pilot's output for quite some time, ever since their first full length Resignation Day. Over the years I've watched them get more and more popular as they've ended up on bigger labels and garnered more fans . Oddly though on this, their fourth album Souvenir, I'm starting to lose a little bit of interest. Not all of my interest in the band, mind you. I'm still a sucker for their anthemic choruses and tightly focused guitar riffs, but 4 records in I just can't shake the feeling that I've heard this all before. Now, let's be clear. I am not one of those guys that wants bands to grow and change into a beautiful butterfly throughout their career. I'm perfectly fine with a band finding something that works and sticking with it. I think the difference with this Banner Pilot record is that rather than seeming like new songs under the same umbrella, a lot of it just feels like retreads. That being said, if you aren't as familiar with the band, this is as good a record as any to start with. If you like your punk rock catchy, but serious, and you tend to go down that No Idea/Dillinger Four rabbit hole; fewer bands do it better. At the end of the day I guess I just wish they'd shake things up a bit. Even though I don't like it when bands change, sometimes you need to do a little tinkering to keep things fresh.